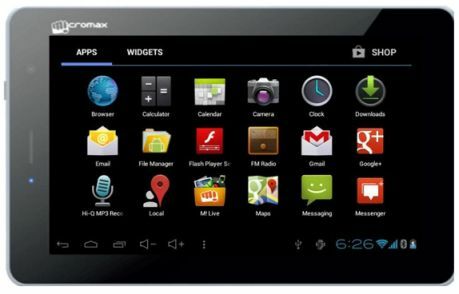 Micromax Funbook Talk P360 is a 7 inch Android tablet which supports voice calling feature now available on popular online stores. Last year Micromax launched the Funbook Talk P360 tablet with voice calling support, now the successor Funbook Talk P360 is updated with more features. Funbook Talk P360 runs on Android 4.0.4 Icecream Sandwich OS and comes with 7 inch capacitive display with 800x480 pixels resolution. It is powered by 1 GHz processor and it equipped with 1 GB of RAM and 4 GB of internal memory. Memory can be expandable up to 32 GB via using microSD cards. The tablet sports a 2 MP primary camera that supports recording HD videos and 0.3 MP front camera for video chatting. And the connectivity options are Bluetooth, Wi-fi and microSD slot. Only 2G sim card allowed for voice calling feature, however you can use 3G internet with a 3G USB dongle. Micromax Funbook Talk P360 is available for Rs. 7049 on Saholic.com online store. Flipkart has also listed the device for some high price at Rs. 7500.